Comments Off on What does pt-show-grants look like? We use Percona’s <A HREF=”https://www.percona.com/doc/percona-server/5.5/management/audit_log_plugin.html”>audit log plugin</A> to keep a record of all our logins. Recently we did one of those tasks that everyone knows they should do, but few ever do: change the application user’s password. When we change the application password, we add a new application user with the proper permissions and a new password, update the information in our repository and wait a while. Using this procedure, any failures mean the old user is used, and more importantly – failure does not impact the end user. We check the audit logs to see if there were failures – if the user is still being used – when it is no longer in use, we can drop the user. This means that we automatically flush logs >1G, keeping 10 audit logs. The other option is to do manual flushing, but we do not want our log files to get very large, and we don’t need to keep audit logs for a very long time. The ideal behavio – we update our app to the new user, and then flush the logs. That way we could start a new audit log and only have to search the current audit log for the old user. I’m sure people are thinking, “well, it’s set to rotate by size, not manually, so you just cannot do it.” However, binary logs are set the same way and FLUSH LOGS do indeed rotate logs manually, even when auto rotate by size is set. Note that this also proves that “FLUSH LOGS” does not close and open the audit log. So, I ended up needing to restart MySQL if I wanted to re-enable the plugin. Sometimes the failures are the most illuminating! 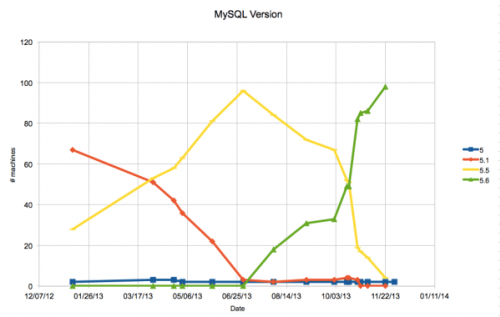 One of the services our database engineers provide is adding users to MySQL. We have some nice Chef recipes, so all I have to do is update a few files, including adding in the MySQL password hash. Now, when I added myself, I just logged into MySQL and generated a password hash. But when my SRE (systems reliability engineer) colleague needed to generate a password, he did not have a MySQL system he could login to. The good news is it’s easy to generate a MySQL password hash. The MySQL password hash is simply a SHA1 hash of a SHA1 hash, with * at the beginning. Which means you do not need a MySQL database to create a MySQL password hash – all you need is a programming language that has a SHA1 function (well, and a concatenate function). And I found it, of course, on this post at StackExchange (http://unix.stackexchange.com/a/234592/217471). So you don’t have to click through, here is what it says – and I have tested all these methods and I get the same password hash. I have changed their example of “right” to “PASSWORD HERE” so it’s more readable and obvious where the password goes, in case you copy and paste from here. mysql -NBe "select password('PASSWORD HERE')"
Hopefully these help you – they enabled my colleagues to easily generate what’s needed without having to find (or create) a MySQL instance that they can already login to. Comments Off on Learn MySQL for Free with MySQL Marinate, Season 3! For me, a Code of Conduct is not actually guidelines for how to act. For me, a Code of Conduct is what to do if there is a problem with someones conduct. When I get on a plane, I am told what to do in case of emergency here are the exits, heres how to use your life jacket and oxygen mask. I am not told every little thing that could be an emergency I believe that would be a waste of time and invariably something would be left out. Similarly, for conferences, listing out all the behaviors that might be problematic is a waste of time, and invariably, behaviors are left out. In my opinion, that is a waste of time. What is NOT a waste of time is giving out the information of what to do in case of emergency. At the MySQL Connect website, under the Plan tab, is a link to the Oracle Events Code of Conduct. It says, simply, to act professionally and respectfully, and if there are any problems, contact Oracle Security and gives a phone numbers. I like that. Simple, and effective. And it was put under the Plan tab exactly where it should be. Its something to note as you plan to attend. I put that number in my phone and, thankfully, did not have to use it. But knowing that I had a plan in case something happened made all the difference to me. *BIG DISCLAIMER I do not speak for all people everywhere on this matter, just myself.